In the past, luxury just meant expensive. But as travellers become more savvy and more tourism options become available, the focus has firmly shifted towards experiences. A five star hotel is no longer enough, it has to have a unique history that differentiates it from the next luxury accommodation. As the largest Canadian member of Virtuoso, we have the enviable task of sending travellers on spectacular luxury vacations. We take that responsibility as a privilege -- to create an experience for someone that will stay with them for the rest of their lives. In the past, luxury just meant expensive. But as travellers become more savvy and more tourism options become available, the focus has firmly shifted towards experiences. A five star hotel is no longer enough, it has to have a unique history that differentiates it from the next luxury accommodation. Lie-flat seats have become the norm, but a one-bedroom suite really lets you fly in style. 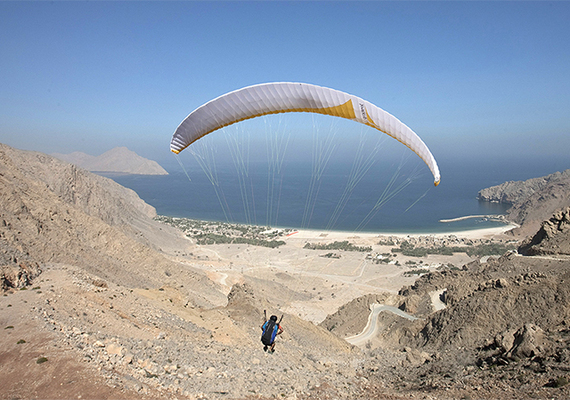 Five years ago, this wouldn't even be something I could imagine, but now this is at the top of my vacation list: Paraglide check-in at the Six Senses Zighy in Oman. Gone are the days when a hotel room was merely a place to rest your head. Luxury accommodations are experiencing a renaissance moment, offering extraordinary experiences to go along with your king size bed. We're seeing tremendous interest in hotels in history such as the 13th century Ashford Castle in Ireland, which received this year's Hotel of the Year award from Virtuoso. Immersive accommodation experiences have also been gaining popularity, such as the Grand Velas Riviera Maya in Mexico, which offers accommodations set in the middle of a jungle, spa set on a dry riverbed and award-winning restaurants. Many elite fliers will splurge to travel first class but having the power to tell the pilot when and where exactly to land a plane a perk in its own class. Private jet charters are rising in popularity, even rapper Jay-Z wants a piece of the pie. Private jet charter services such as Executive Charter Services, offers maximum flexibility with access to 10 times more airports than commercial flights, and options for single passenger jets to parties of 15 or more. Family travel is getting an upgrade as multigenerational travel rises in popularity. Grandparents, parents, and young children alike are now going on once in a lifetime trips to places like the Galapagos Islands and elusive African safaris where the adventure accommodates all ages. In the past, families were limited to less luxe travel options as experiences such as safaris had age limitations, but as demand to accommodate several generations in one trip increases, many operators are lifting restrictions and implementing special programs that cater to different age groups. If you're looking for complete solitude, there is no better place than your very own private island. Some of these estates are so private that they have restrictions on the waters surrounding the area prohibiting outsiders from entering. Popular destinations include Richard Branson's Necker Island, in the British Virgin Islands, which goes for $50,000 a night and David Copperfield's Musha Cay located 85 miles southeast of Nassau, Bahamas for $32,250 a night. Prepare award-winning dishes alongside celebrity chefs, find yourself face to face with some of the world's most fascinating species or glide past glaciers at the top or bottom of the world are just some of the unique experiences available to niche travellers. Some of our most popular tours are walking and cycling tours that take you off the beaten path and immersed in the local culture. The cycling tour of Vietnam for example, takes you North to South on a 15 day bike ride across the Halong Bay, into local villages, coffee plantations and jungle paths.